Choosing a wireless security camera system for your home used to be difficult because there are so many options out there. Ever since Anker released its eufyCam E Wireless Home Security Camera System, however, the decision couldn’t be easier. These fantastic wireless home security cameras have crystal clear 1080p resolution and they’re weatherproof, so you can install them indoors and outdoors. While Arlo cameras typically last for 2 or 3 months per charge, the eufyCam E lasts for a remarkable 365 days before you need to change the batteries or up to 3 full years in standby mode. The eufyCam E doesn’t have any subscription fees because it stores recordings on a microSD card which can hold up to one year’s worth of footage. The included base station packs a nice loud siren that can be configured to sound when the system is armed and a predefined trigger is tripped. eufy also offers Security Entry Sensors for $29.99 each that feature incredible 2-year battery life and can be installed on any door or window in seconds. This way you can trigger alerts or even the siren when the system is armed and a door or window is opened. Best of all, since the camera stores security footage on an included 16-gigabyte microSD card (expandable up to 128 GB), there are no monthly fees whatsoever with the eufyCam E system. 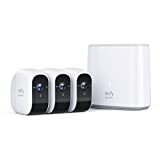 The 3-camera system that includes eufy’s base station and 3 wireless home security cameras retails for $560, but right now it’s on sale for just $420 if you use the coupon code BGRCAMEE at checkout. This is a limited-time deal though, so you should definitely hurry if you don’t want to miss out!